Are you engaging your web visitors and social media community? Do you have an “engagement” action plan”? Engagement in Your Digital Marketing Strategy is all about what you need to do at the TOP of your digital funnel to CONNECT. 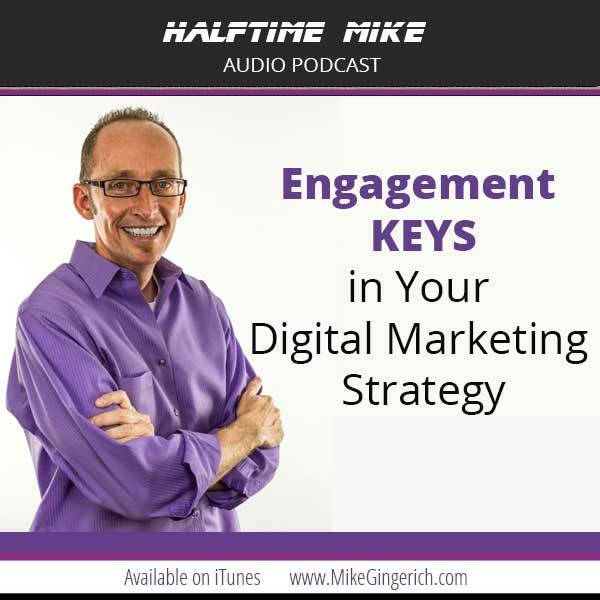 In this episode of the halftime Mike podcast I dive into the “Engagement” area of the digital marketing funnel. What it is, what you need to do, and how it works! 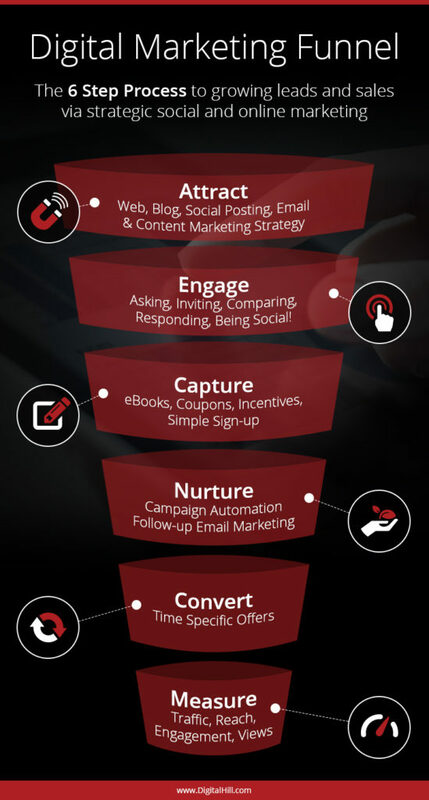 Here’s a window into the total digital marketing funnel outline and note “Engage” second to the top of the funnel. This is our focus today! 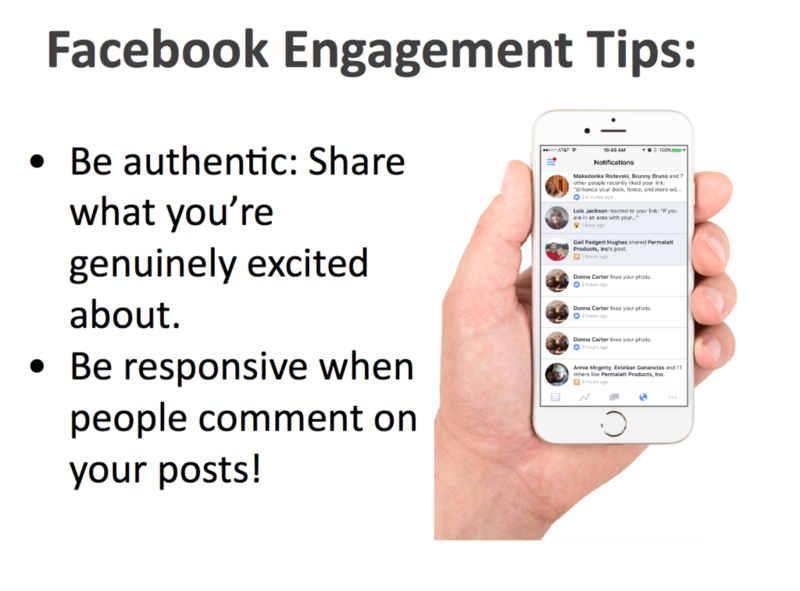 Engaging is the art and science of responding and being social with your community. It can happen on your website and it definitely happens with social media. It’s about responding, acknowledging, answering questions and offering support. You need to show attentiveness, care, and warmth. In other words…your brand must be human! Because in this day and age, it can be a competitive advantage and differentiator! As well, many businesses are not ready to buy from a company right away. They need to have multiple points of contact to better know, like, and trust the business. That’s right, the majority of people you engage with will not be seeking to buy right way. However, since we know that it takes 7 points of contact before people have enough information to Know, Like, and Trust us enough to buy from us, engagement is key because it can be points 2-6 in the “connection” process towards making a purchase from you. 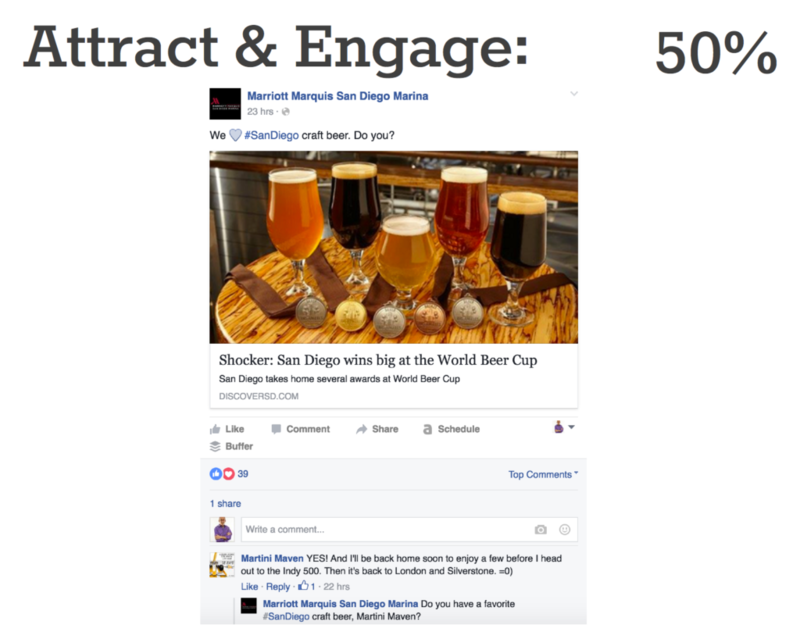 The major issue today is that businesses are simply overlooking and skipping engagement. They continue to be “old-school.” Old-school marketing was all “push”. From billboards to magazine ads and more, but today, being social is at the forefront. People need to like you before they will want to do business with your company and buy your product! The way they will build that “like” mentality is through interaction. To market on social media is to need to be ready to and committed to engagement. Answer comments, reply to @ mentions, follow then on Twitter/Instagram/Pinterest back, etc. Engagement is about making the valuable effort to respond. Do your utmost best to respond in a timely fashion! Even if you are on the go, let them know you’ll get back with more detail. It started with a simple question…. We love San Diego craft beer. Do you? The question begged for engagement and the fans did not disappoint! The KEY here is that the Facebook Page responded and followed up with more engagement, a question! You gotta engage! Social is a two-way street and it’s a way for you to build rapport and make those connection points that build the know-like-trust relationship! So what’s your key takeaway from this? What do you need to do in the next 24 hours based on listening? Resources outlined in this episode. Click each to explore! Please let your Twitter followers know about this podcast. Simply click here now to post a tweet >>.